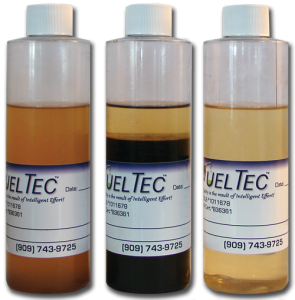 Fuel and Tank Polishing Division - Fueltec, Inc. The Fuel and Tank Polishing division specializes in polishing fuel tanks for a wide variety of customers, from small commercial clients to large industrial customers. We handle all types of fuel including gasoline, diesel and aviation fuel in both underground storage tanks (UST) and above ground storage tanks (AST). We access the tank at one end through the fill riser and the opposite end by one of 3 possibilities; removing the probe, removing a 4 inch plug or in worst case scenarios, removing the turbine. 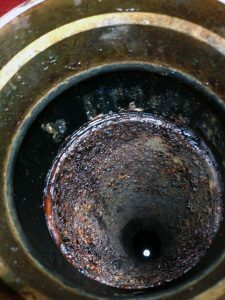 The process of cleaning each tank begins with focusing on Water Removal first, then Tank-Bottom cleaning and finally Agitating the tank through Polishing using the High Pressure Discharge Line to disturb remaining Sediment and Algae at the bottom that may attach itself high up the tank walls. Our Coalescer will remove any suspended water molecules reducing the waste generated. Basically, we are pumping out of one end of the tank and returning clean fuel to the opposite end. The tank will be continuously sampled to measure progress. 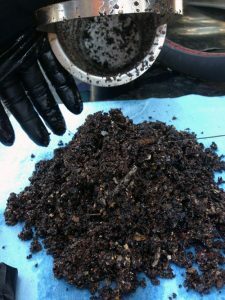 The process will continue until samples show desired level of fuel cleanliness. Time on site depends on how dirty the tank is. Our flow rates average 90 to 110 gallons per minute and a 10,000 gallon tank averages 2 to 3 hours, sometimes longer. Our system can handle tanks as large as 50,000 gallons. We use 5 Micron filters for Diesel and Unleaded fuels. Jet Fuel, Avgas and Amber fuels require as low as 1/2 micron and we can fulfill that requirement. Before and After samples are presented to the customer. All areas accessed or disturbed during this process are will be cleaned, secured and/or returned to their original condition. The customer is informed of any discrepancies uncovered. The waste will be manifested and removed from your facility and taken to an EPA approved recycling and disposal facility. The waste will be profiled, tested and off-loaded from our truck once it is accepted. 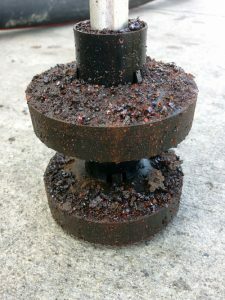 The disposal process normally takes several hours including testing time and off-loading, as well as travel time to and from the disposal site. Call Fueltec today. We look forward to working with you.